Stems: Slender vine, twining, 1/25 to 1/16 inch in diameter, glabrous, greenish-yellow, yellow or orange; often withered or absent by flowering. Leaves: Alternate, reduced to scales; appears leafless. 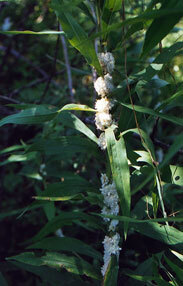 Inflorescences: Clusters, dense, rope-like, winding around stem of host plant. Flowers: Flowers sessile, in 2 densely clustered parallel rows on opposite sides of stems, subtended by bracts; bracts numerous, overlapping, lanceolate; tips pointed, curved downward; calyx deeply divided; sepals 5, oblong-oval; tips blunt to pointed, spreading; corolla cylindrical, 1/6 to 1/5 inch long, 5-lobed, white or yellowish, fragrant; lobes pointed, spreading or curved backward; stamens shorter than corolla lobes. Fruits: Capsule, spherical with pointed tip or thickened collar, thus appearing flask-shaped; seeds 0-2, oval, about 1/15 inch long, brown. Habitat: Prairies, roadsides, stream banks, low areas, damp sites. Comments: Dodder is parasitic on the above ground portion of other plants. Rope dodder is often found growing on Asteraceae such as Helianthus and Solidago.